I believe this combination of problems has led to graph databases not seeing as much use as they probably should get as an generic format for biological data. It also doesn't help that there are few good in-browser visualisation tools to graphically query graphs without learning gremlin or Cypher syntax (SQL for graphs) which is what a lot of the biologists and already-overloaded Bioinformaticans would probably appreciate. 1. 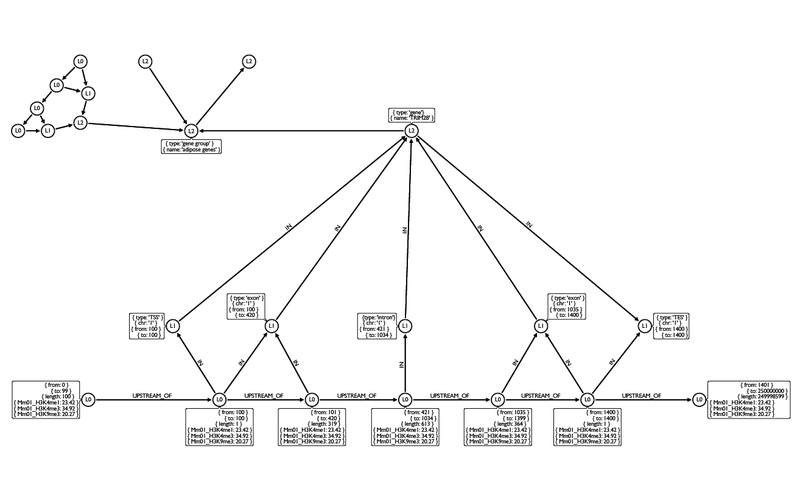 Rebuild popular SQL databases like UCSC's table browser into a MUCH simpler graph database. Allow users to download the full graph, or sub-graphs, with an easy query form. 2. Create a generic CSV parser/importer for genomic data. It would roll out the columns with multiple values per cell (exons,VCF) understand biological formats (chr:start-end formats), help you design a schema for the resultant graph, and finally output a graph database. The latter would be more challenging to make, more complicated to use, but provides the most flexibility and compatibility down the road. Before I set down the road to building out one or both of these paths, does anyone know if either options already exist? Is there an easier way I have overlooked? Would you like to help me remake the UCSC database (or parts of it) as a graph database? graph database are great for searching for relations between nodes. What's cool with UCSC is that you can quickly search for features in genomic regions (bin index). Think about this before starting writing you database. The table Snp142 contains 115,877,267 records. Do you really want to put this in a graph ? L2 - collections of things. A collection of exons (a gene). A collection of genes (a pathway). A collection of SNPs, etc. L1 - single units of genomic space. An exon. A SNP. A TSS. Something with a defined start and end. Can overlap other L1s. L0 - The smallest unit of information in the database. Non-overlapping start and end. Theoretically 1bp, but more likely to be many bp after binning signal or runs of the same signal, etc. In this schema, even if it was a billion nodes and 3 billion relationships, you could pull out 'all signal in genes X and Y', modifying the query only slightly to differentiate between include overlapping regions, and exclude overlapping regions. You could even plug it in to a genome browser if it supported it. Getting Ucsc Headers For Tables Through Ftp Or Via Sql?